One market phenomenon noticed by many investors has been the elevated use of excess cash flow by companies to fund stock buyback programs. 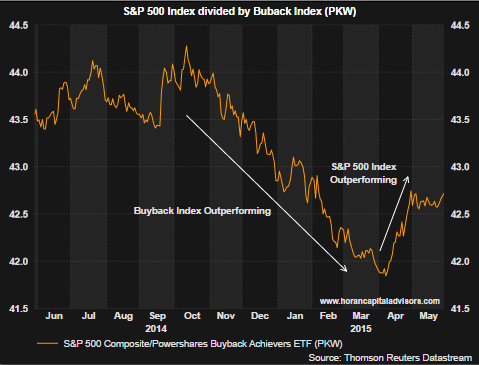 The demand for these buyback oriented equities has resulted in their significant outperformance versus the broader S&P 500 Index as can be seen in the below chart. The U.S. equity market bottomed in March of 2009 following the financial crisis. From Q1 2009 through Q4 2014, S&P 500 companies have spent $3.8 trillion on dividends and buybacks. Reported earnings over this same time period totaled $4.5 trillion. As a result companies used 84% of their earnings to fund these dividend and buyback programs. Understandably, companies repurchased shares in the 2009 - 2012 period when share prices were depressed; however, accelerating buybacks at this point in time may be causing investors to rethink exposure to high buyback oriented firms. 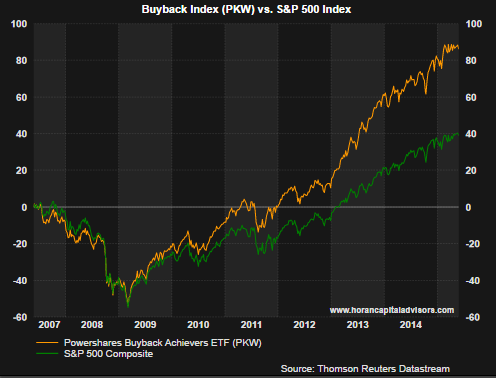 Since April the buyback index (PKW) has been underperforming the S&P 500 Index as can be seen in the following chart. Lastly, as I noted in a post several years ago, firms have a tendency to buyback shares when stock prices are near highs. This fact may be causing investors to turn more cautious on companies buying back shares in an environment where some stocks may be trading at elevated valuation levels.